The William Henry B04 Ares folding knife is also called the Pikatti, meaning "companion" in Eskimo. Indeed, it makes a great companion for everyday carry. The Ares is the smallest pocket knife William Henry has to offer: measuring only 4.63 inches when open and weighing only 1.1 ounce, this folding knife packs a punch for its small size. 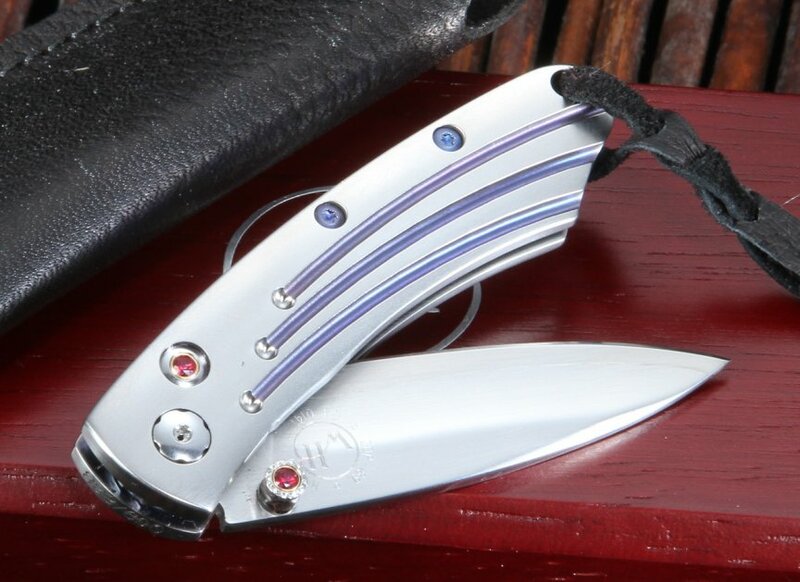 This knife is a limited edition of only 888 individually numbered blades --the knife comes with a certificate of authenticity and in a presentation box--owning an Ares makes for a unique, durable and reliable pocket knife. The spear point shaped blade is made out of high quality ZDP-189 stainless steel, and measures at just 2 inches long. This type of steel can hold an edge for a long period of time. With a hand satin finish, the blade has a clean uniform finish. The spear point shape allows for easy cutting and piercing through various types of materials. 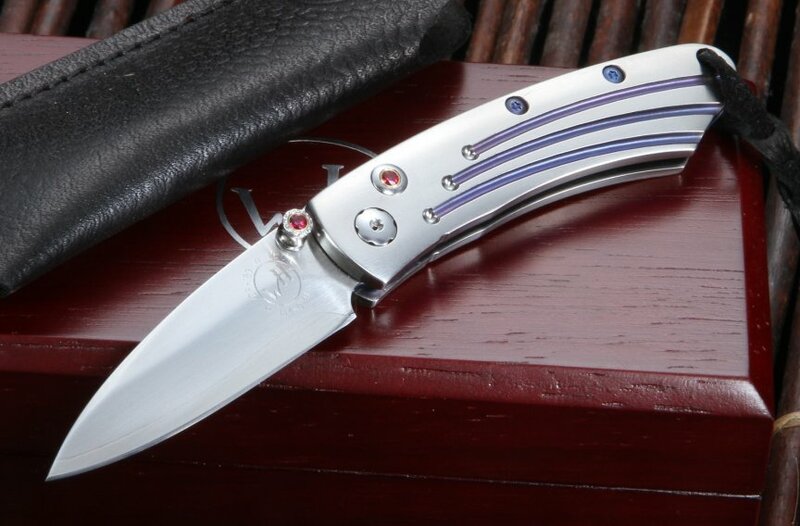 The William Henry Ares handle is made from aerospace grade titanium with a satin finish to ensure its light weight and strength, and features fittings and specially machined groves that are anodized in an electric blue. At 2.63 inches long closed, the knife fits comfortably in your hand, without being too small to slip out of grasp. The knife opens with the jewel inlaid thumb stud, crafted with blazing red topaz to add artistic character to the sleek knife. The handle is also fitted with a lanyard hole and a black leather braided lanyard. 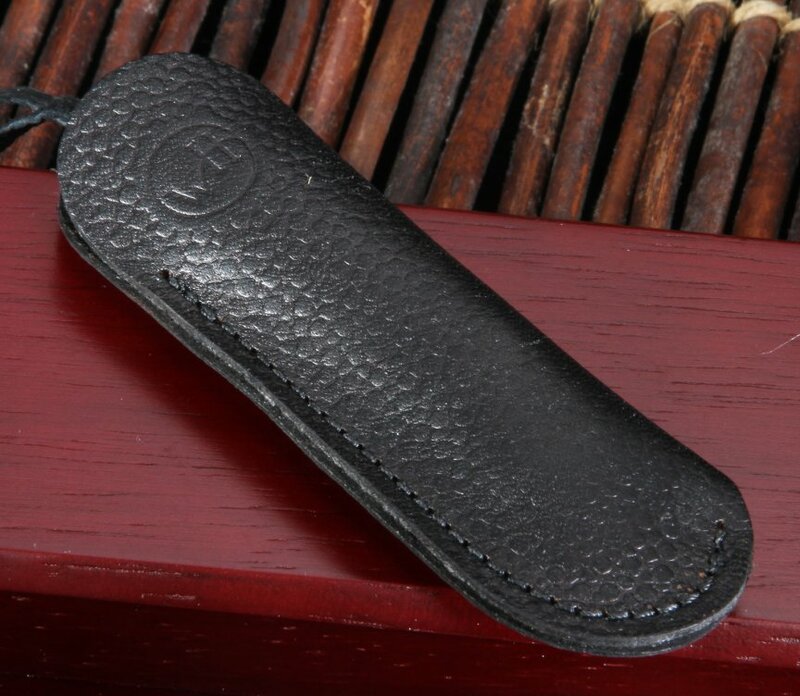 This knife comes with a black leather clip case that provides the user multiple carry options while protecting the handle finish. 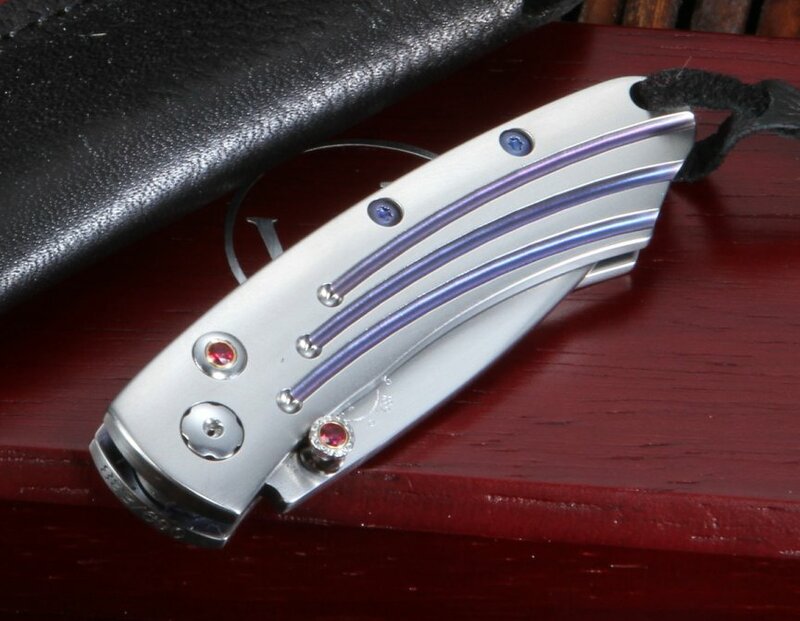 You can order with confidence from Knife Art; we offer fast free shipping in the US along with a full satisfaction guarantee. We have been an authorized dealer for William Henry since 1998. The William Henry Pikatti is a beautiful piece of art and a great collectable. very pleased with the product and arrived in timely manner. also called a couple of times with questions and staff very helpful.